Beumer Group has flexible, fast and economical solutions to all your bulk material handling applications. GERMANY – For material handling between mines, processing plants and beyond, Beumer Group offers complete solutions whether for ores or concentrate, iron, copper, gold, phosphates. Beumer provides the right technology for all kinds of project goals thanks to decades of experience. 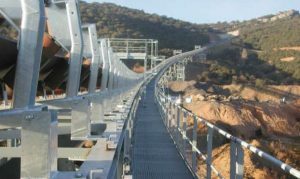 Run your mine efficiently, economically and safely, with products including hoppers, apron feeders, jump conveyors, movable and long distance conveyors. Conveying and loading. Long distances, large height differences or small radii are no problem. Bucket elevators. Conveying heights up to 175 metres and 1,800 me/h are feasible. Overland Belt Conveyors. The ability to adapt to topographical conditions with horizontal and vertical curves reduces the number of transfer points and the total number of conveyors. Storage and blending. All sizes from a single buffer facility or complete bulk terminal are possible. Port technology. A variety of system styles provide fast, safe and environmentally friendly ship loading. Find what best suits your project at any stage by visiting www.BeumerGroup.com.